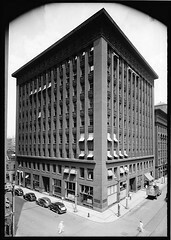 This historic photo of the Wainwright Building clearly reveals its steel frame construction as well as the manner in which the masonry shell encases and "expresses" it. It's not difficult to image the same sort of steel frame supporting a more recent skyscraper. However, Sullivan did not simply accept the structural engineer's geometry and simply mimic or represent it on the facade. Instead, the steel columns are coordinated with the overall geometry of the building such that every other masonry pier contains a steel column (and is therefore structural). Therefore the alternate piers are non-structural. Some might believe this to be an example contradicting Sullivan's famous dictum that "Form follows function." From Sullivan's viewpoint, I don't think he saw any conflict whatsoever. I believe his understanding of a building's "function" to be much more than the technical realities hidden within the construction. The so-called Functionalists have completely misunderstood and misinterpreted Sullivan's concept regarding the function of architecture. Rather than some form of materialism, truth to materials, or the representation of a building's internal functions, Sullivan conceived of the function of architecture to be among the highest expressions of a culture. So a building is meant to satisfy deeper, more fundamental needs of a spiritual and psychological nature rather than an expression of mere matter. I believe Sullivan's ideas of "Organic Architecture" have been similarly misunderstood and misinterpreted by generations of architects attempting to follow his principles. At right you see a documentary photograph taken in 1933 for the HABS (Historic American Building Survey) project from a very similar viewpoint (compare to above construction photograph). The construction photograph above was published in James F. O'Gorman. Three American Architects: Richardson, Sullivan, and Wright, 1865-1915. Chicago & London: The University of Chicago Press, 1991. The image appears on page 100 and is captioned as follows: "Figure 64. Adler and Sullivan, in construction (L'Architecture, 1894: University of Pennsylvania Library; photo courtesy of George E. Thomas)." For additional information on the Wainwright Building see: Saint Louis Historic Preservation, Great Buildings Online, and The Library of Congress. You can search for many other photographs of the Wainwright Building on Flickr. that construction photo is amazing. where did you find it? LisaS . . . that's a good question. I can tell you for certain that . . . I'm not sure. I must've found it on a website somewhere and snatched it. That's a very nice photo of the past building construction. Great!!! James F. O'Gorman. Three American Architects: Richardson, Sullivan, and Wright, 1865-1915. Chicago & London: The University of Chicago Press, 1991. The image appears on page 100 and is captioned as follows: "Figure 64. Adler and Sullivan, in construction (L'Architecture, 1894: University of Pennsylvania Library; photo courtesy of George E. Thomas)." Who holds the rights to the construction photo? Where might I acquire this? I'm not sure about the copyright. I was contacted by an author from Scandinavia who wished to include it in a scholarly publication. I gave him the information that I've posted here regarding its origins, to the extent that I understand them.